The Bristol Blenheim was a British light bomber aircraft designed and built by the Bristol Aeroplane Company that was used extensively in the early days of the Second World War. It was adapted as an interim long-range and night fighter, pending the availability of the Beaufighter. It was one of the first British aircraft to have all-metal stressed-skin construction, to utilise retractable landing gear, flaps, powered gun turret and variable pitch propellers. A Canadian-built variant named the Bolingbroke was used as an anti-submarine and training aircraft. The Blenheim Mk I outshone most biplane fighters in the late 1930s but stood little chance against the German Messerschmitt Bf 109 during daylight operations, though it proved successful as a night fighter. The Mark IV variant was equally unsuccessful, suffering major losses in the early stages of the war. 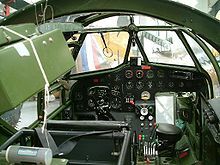 Picture - Blenheim Mk IV cockpit. Note the asymmetry of the instrument console, indicating the position of the scooped out area of the nose in front of the pilot. The ring and bead gunsight for the forward firing guns is visible. In 1934, Lord Rothermere, owner of the Daily Mail newspaper, issued a challenge to the British aviation industry to build a high-speed aircraft capable of carrying six passengers and two crew members. At the time, German firms were producing a variety of high-speed designs that were breaking records, and Rothermere wanted to recapture the title of fastest civilian aircraft in Europe. Bristol had been working on a suitable design as the Type 135 since July 1933, and further adapted it to produce the Type 142 to meet Rothermere's requirements. When it first flew as Britain First at Filton on 12 April 1935, it proved to be faster than any fighter in service with the Royal Air Force at the time. The Air Ministry was obviously interested in such an aircraft and quickly sent out Specification B.28/35 for prototypes of a bomber version; the Type 142M (M for military). The main changes were to move the wing from a low-wing to a mid-wing position, allowing room under the main spar for a bomb bay. The aircraft was all-metal with two Bristol Mercury VIII air-cooled radial engines, each of 860 hp (640 kW). It carried a crew of three - pilot, navigator/bombardier and telegraphist/air gunner. Armament comprised a single forward-firing .303 in (7.7 mm) Browning machine gun outboard of the port engine and a .303 in (7.7 mm) Lewis Gun in a semi-retracting Bristol Type B Mk I dorsal turret firing to the rear. From 1939 onwards, the Lewis gun was replaced by the more modern .303 in (7.7 mm) Vickers VGO machine gun of the same calibre. A 1,000 lb (450 kg) bomb load could be carried in the internal bay. 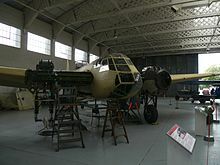 To achieve its relatively high speed, the Blenheim had a very small fuselage cross-section, with its upper front glazing all at one angle in the form of a "stepless cockpit", that used no separate windscreen panels for the pilot. Pilot's quarters on the left side of the nose were so cramped that the control yoke obscured all flight instruments while engine instruments eliminated the forward view on landings. Most secondary instruments were arranged along the left side of the cockpit, with essential items like propeller pitch control actually placed behind the pilot where they had to be operated by feel alone. Like most contemporary British aircraft, the bomb bay doors were kept closed with bungee cords and opened under the weight of the released bombs. Because there was no way to predict how long it would take for the bombs to force the doors open, bombing accuracy was consequently poor. The aircraft was ordered directly from the drawing board with the first production model serving as the only prototype. The name then became Blenheim Mk I after a historic German village where the British had won a great victory. Subsequent deliveries started on 10 March 1937, with 114 Squadron being the first squadron to receive the Blenheim. The aircraft would prove to be so successful that it was licensed by a number of countries, including Finland and the Yugoslavia, which completed 60 examples. Other countries bought it outright, including Romania, Greece and Turkey. Total production of the Blenheim Mk I in England amounted to 1,351 aircraft. Another modification led to a long-range fighter version; the Blenheim Mk IF. For this role, about 200 Blenheims were fitted with a gun-pack under the fuselage for four .303 in (7.7 mm) Brownings. Later, the Airborne Intercept (AI) Mk III or IV radar was fitted to some aircraft in use as night fighters; these were the first British fighters to be equipped with radar. Their performance was marginal as a fighter, but they served as an interim type, pending availability of the Beaufighter. About 60 Mk IVs were also equipped with the gun pack as the Mk IVF and were used by Coastal Command to protect convoys from German long-range bombers. 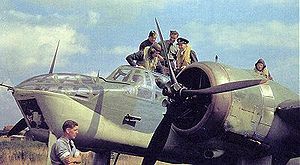 The Blenheim served as the basis for the Beaufort torpedo bomber, which itself led to the Beaufighter, with the lineage performing two complete circles of bomber to fighter. 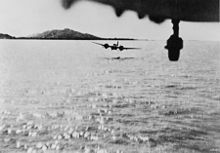 On the day that war was declared on Germany a Blenheim piloted by Flying Officer Andrew McPherson was the first British aircraft to cross the German coast and the following morning 15 Blenheims from three squadrons set off on one of the first bombing missions. With the rapid advances in technology which had taken place in the late 1930s, by then the aircraft was already obsolescent. The Blenheim was regarded as a pleasant aircraft to fly, although it did have some characteristics which could catch even experienced pilots by surprise. It had become heavier as extra service equipment was installed; much of this was found to be needed through operational experience. This, coupled with the rapid performance increases of fighters, had eclipsed the Blenheim's speed advantage. The Blenheim units raided German occupied airfields throughout July to December 1940, both during daylight hours and at night. Although most of these raids were unproductive there were some successes; on 1 August five out of 12 Blenheims sent to attack Haamstede and Evere (Brussels) were able to bomb, destroying or heavily damaging three Bf 109s of II./JG 27 and apparently killing a Staffelkapitan identified as Hauptmann Albrecht von Ankum-Frank. Two other 109s were claimed by Blenheim gunners. Another successful raid on Haamstede was made by a single Blenheim on 7 August which destroyed one 109 of 4./JG 54, heavily damaged another and caused lighter damage to four more. There were also some missions which produced an almost 100% casualty rate amongst the Blenheims; one such operation was mounted on 13 August 1940 against a Luftwaffe airfield near Aalborg in north-eastern Denmark by 12 aircraft of 82 Squadron. One Blenheim returned early (the pilot was later charged and due to appear before a court martial but was killed on another operation), the other 11, which reached Denmark, were shot down, five by flak and six by Bf 109s. As well as the bombing operations, Blenheim-equipped units had been formed to carry out long-range strategic reconnaissance missions over Germany and German-occupied territories. In this role, the Blenheims once again proved to be too slow and vulnerable against Luftwaffe fighters and they took constant casualties. The action on 12 August 1941 was described by the Daily Telegraph in 2006 as the "RAF's most audacious and dangerous low-level bombing raid, a large-scale attack against power stations near Cologne." The raid was a low-level daylight raid by 54 Blenheims under the command of Wing Commander Nichol of No. 114 Squadron RAF. The Blenheims hit their targets (the Fortuna Power Station in Knapsack and the Goldenburg Power Station in Quadrath) but 12 of the Blenheims were lost during the raid, 22% of those that took part which was far above the sustainable loss rate of less than 5%. The Bristol Blenheim was used by both Bomber and Fighter Commands. Some 200 Mk I bombers were modified into Mk IF long-range fighters with 600 (Auxiliary Air Force) Squadron based at Hendon, the first squadron to take delivery of these variants in September 1938. By 1939, at least seven squadrons were operating these twin-engine fighters and within a few months, some 60 squadrons had experience of the type. The Mk IF proved to be slower and less nimble than expected, and by June 1940, daylight Blenheim losses were to cause concern for Fighter Command. It was then decided that the Mk IF would be relegated mainly to night fighter duties where No. 23 Squadron RAF who had already operated the type under night time conditions had better success. In the German night bombing raid on London, 18 June 1940, Blenheims accounted for five German bombers thus proving they were better suited to a nocturnal role. In July, No. 600 Squadron, by then based at RAF Manston, had some of its Mk IFs equipped with AI Mk III radar. With this radar equipment, a Blenheim from the Fighter Interception Unit (FIU) at RAF Ford achieved the first success on the night of 2-3 July 1940, accounting for a Dornier Do 17 bomber. More successes came and, before long, the Blenheim proved itself invaluable in the night fighter role. Gradually, with the introduction of the Bristol Beaufighter in 1940-1941, the Blenheim was supplanted by its faster, better armed progeny. 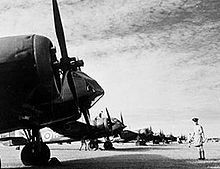 Blenheims continued to operate widely in many combat roles until about 1943, equipping RAF squadrons in the UK and in British bases in Egypt, Iraq, Aden, India, British Malaya, Singapore, and the Dutch East Indies. Many Blenheims were lost to Japanese fighters during the Malayan Campaign, battles for Singapore, and Sumatra. By that point, the traditional daylight light bomber role was more effectively carried out by suitable fighter-bombers, and the surviving examples were relegated to training duties. 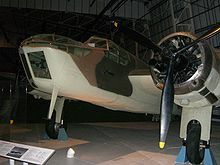 Nonetheless, the Blenheim played a role in preventing India from falling and recapturing Burma, destroying over 60 aircraft on the ground in raids on Bangkok early in the campaign. One Blenheim pilot, Squadron Leader Arthur Scarf, was posthumously awarded the Victoria Cross for an attack on Singora, Thailand, on 9 December 1941. Another bomber of No. 60 Squadron RAF was credited with shooting down Lt Col Tateo Katō's Nakajima Ki-43 fighter and badly damaging two others in a single engagement on 22 May 1942, over the Bay of Bengal. Katō's death was a severe blow for the Imperial Japanese Army Air Force. The Air Ministry's replacement for the Blenheim as a daylight bomber, another Bristol design the Buckingham, was overtaken by events and changes in requirements and considered inferior to the de Havilland Mosquito, and as such did not see combat. The final ground attack version - the Blenheim Mk V - first equipped 139 Squadron in June 1942. Eventually 13 squadrons - mainly in the Middle East and Far East - received this variant but operated them generally only for a few months. In 1936, the Finnish Air Force ordered 18 Blenheim Mk Is from Britain and two years later, they obtained a manufacturing license for the aircraft. Before any aircraft could be manufactured at the Valtion lentokonetehdas (State Airplane Factory) in Finland, the Winter War broke out, forcing the Finns to order more aircraft from the UK. A further 24 British-manufactured Blenheims were ordered during the Winter War. After the Winter War, 55 Blenheims were constructed in Finland, bringing the total number to 97 aircraft (75 Mk Is and 22 Mk IVs). The Finnish Blenheims flew 423 missions during the Winter War, and close to 3,000 missions during the Continuation War and Lapland War. Blenheim machine gunners also shot down eight Soviet aircraft. Thirty-seven Blenheims were lost in combat during the wars. After the war, Finland was prohibited to fly bomber aircraft. However, some of the Finnish Blenheims continued in service as target tugs until 1958. Picture - Blenheim Mk I at the Imperial War Museum Duxford. There are currently no Blenheim or Bolingbroke aircraft that are airworthy. The first airworthy Blenheim had been rebuilt from a scrapped Bolingbroke over a 12-year period, only to crash at an airshow at Denham within a month of completion. A replacement Bolingbroke Mk IVT was rebuilt to flying status in just five years and painted to represent a Blenheim Mk IV in RAF wartime service. It began appearing at air shows and exhibitions in the UK, flying since May 1993 and was used in the 1995 film version of Shakespeare's Richard III. This aircraft crashed on landing at Duxford on 19 August 2003; the crash was feared to have made it a write-off, but it is presently undergoing an extensive repair and conversion to Mark 1 status ("Short nose" version) in conjunction with The Aircraft Restoration Company (ARC or ARCo), most of the work being done by volunteers. Funds are raised through donations and also by The Blenheim Society who run a Grand Flying Draw among many other activities. 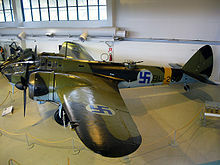 The aircraft is currently in Hangar 3 at the Imperial War Museum at Duxford and is the property of Blenheim (Duxford) Ltd.
Picture - BL-200 at the Aviation Museum of Central Finland. In Canada, a number of other Bolingbrokes survived the war but were summarily consigned to the scrap heap. Postwar, enterprising farmers often bought surplus aircraft such as these for the scrap metal content, tires for farm implements, and even for the fuel remaining in the tanks. Some surviving examples in Canada of the Bolingbroke can be traced back to this period. The Canadian Warplane Heritage Museum in Hamilton, Ontario is rebuilding a Bolingbroke to airworthy status. The Commonwealth Air Training Plan Museum in Brandon, Manitoba has restored the exterior of one Bolingbroke, painting it in the Air Training Plan yellow color. This particular aircraft is on display at a location (49�53′14.39″N 99�56′58.55″W﻿ / ﻿49.8873306�N 99.9495972�W﻿ / 49.8873306; -99.9495972) on the Trans-Canada Highway in Brandon. The Canadian Museum of Flight at Langley Airport, Langley, British Columbia has on display the restored nose and cockpit section of a Bolingbroke, and holds the rest of an entire airframe in storage pending future restoration and display. In Finland, the sole surviving original Blenheim in the world, a Mk IV registered as BL-200 of the Finnish Air Force, has been completely restored and is now on show at the Aviation Museum of Central Finland at Tikkakoski Aviation Museum of Central Finland. In Greece a Bristol Blenheim Mk IVF was recovered from the sea and moved to the Hellenic Air Force Museum for restoration. Chorley, W.R. RAF Bomber Command Losses of the Second World War: 1939-40 v. 1. Earl Shilton, Leicester, UK: Midland Publishing, 1998. ISBN 978-0904597851. Ciglic, Boris and Dragan Savic.Croatian Aces of World War II (Osprey Aircraft of the Aces - 49). London: Oxford, 2002. ISBN 1-84176-435-3. Falconer, Jonathon. The Bomber Command Handbook 1939-1945. Stroud, UK: Sutton Publishing Limited, 1998. ISBN 978-0750918190. Keskinen, Kalevi et al. Suomen Ilmavoimien Historia 10, Bristol Blenheim (in Finnish). Loviisa, Finland: Painoyhtymx� Oy, 2004. ISBN 952-99432-1-0. Marttila, Jukka. Bristol Blenheim - Taitoa ja tekniikkaa (in Finnish). Vantaa, Finland: Blenimi-Publishing, 1989. ISBN 952-90017-0-3. Mondey, David. The Hamlyn Concise Guide to American Aircraft of World War II. London: Aerospace Publishing Ltd, 1996. ISBN0-7858-1361-6. Warner, G. The Bristol Blenheim: A Complete History. London: Cr�cy Publishing, 2nd edition 2005. ISBN 0-85979-101-7.